A dashcam video has emerged online allegedly showing the spot where Russian opposition politician Boris Nemtsov was gunned down, three minutes after the attack took place in central Moscow on February 27. 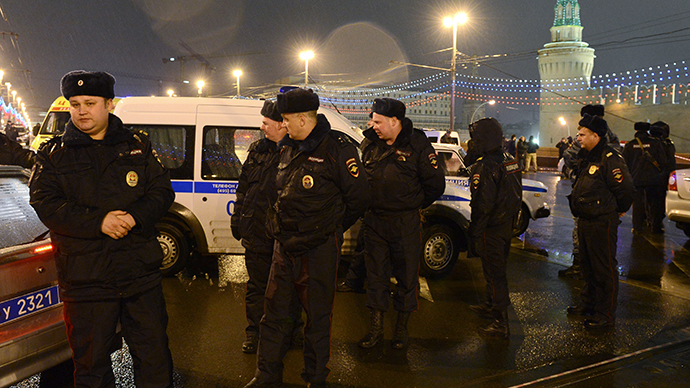 The footage came from a car, moving across the Bolshoy Moskvoretsky Bridge, near the Kremlin, at 00:35 MSK, three minutes after the fatal shooting. Journalist Tonya Samsonova posted the video in her blog on Echo of Moscow’s website. She said the footage has already been handed over to investigators, and that the owner of the clip gave permission for it to be published online. The video shows a snow-cleaning vehicle and a metallic colored car parked near the pavement where the murder happened. There are also two human figures in the clip, one of them dressed in white and the other in dark clothes. Nemtsov was accompanied by Ukrainian model, Anna Duritskaya, who was wearing a white coat when the politician was shot and killed. It’s the second video to surface from the tragic night’s events. The TVC center had previously released footage from its all-weather camera overlooking the Bolshoy Moskvoretsky Bridge. Despite its low resolution, you can see traffic and pedestrians on the bridge in the TVC video. The murder occurred when Nemtsov and Duritskaya were hidden from the camera by a snow-clearing vehicle, which was passing by and then stopped. The killer, who was apparently waiting for the politician on the stairs of the bridge, escaped in a car, which stopped near the murder site to pick him up. A witness told LifeNews, the vehicle the killer used was a silver-colored Russian-made VAZ-21102, with plates registered in North Ossetia, a Russian republic. The second car from the newly emerged dashcam clip is also present in TVC’s footage. It stops near the snow-cleaning vehicle and then drives away after remaining at the crime scene for several seconds. 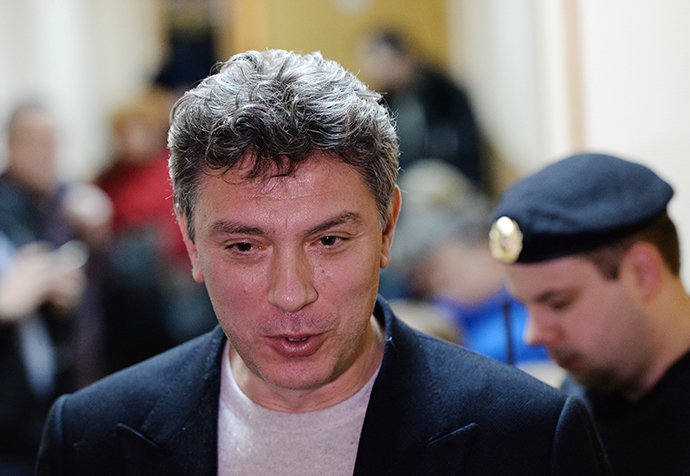 Nemtsov was hit in the back four times and died at the scene, while Duritskaya escaped unharmed. The model failed to describe the killer or the car he used to the police, saying she couldn’t remember anything due to shock. According to the media, the killers used three cars on the day of Nemtsov’s murder and had kept tabs on the politician since the morning. The police reportedly found one of the cars: a Ukrainian-made ZAZ Chance, registered to a woman in the Moscow Region. She had reportedly sold the vehicle some time ago. REN TV cited a source close to the investigation on Wednesday, who said investigators have created identikit images of the perpetrators after tracing their escape route via CCTV footage. “At least, two people were caught in the frame. We can already say that these people are likely to be natives of southern Russia,” the source said, adding that the images of the suspects won’t be made available to the public. 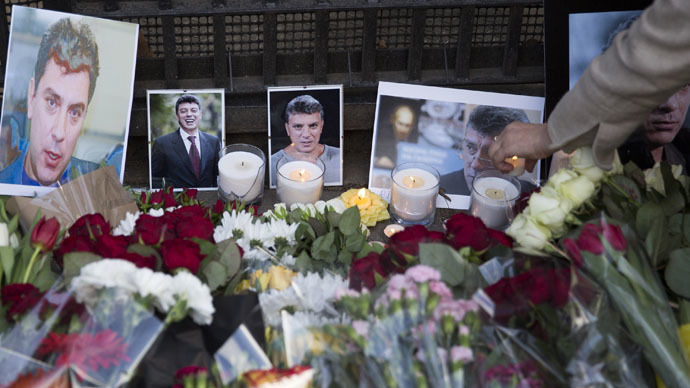 Investigators are currently looking into five possible motives behind Nemtsov’s assassination. According to Vladimir Markin, spokesman for the Investigative Committee, the murder may have been a provocation to destabilize the political situation in Russia. It could also be linked to threats Nemtsov received over his stance on the Charlie Hebdo attack in Paris, or the current war in Ukraine. The politician’s business activities and a possible assault related to his personal life are also being looked into. Nemtsov, 55, gained popularity as governor of Nizhny Novgorod region from 1991-1997. He also served as energy minister and deputy prime minister under former President Boris Yeltsin. After 1998, he participated in the creation of several liberal movements and parties, serving as a member of parliament. Since 2012, he had co-chaired the liberal party RPR-PARNAS (Republican Party of Russia – People's Freedom Party), and was more involved in business than politics. Nemtsov’s murder has been condemned around the globe, with US President Barack Obama and German Chancellor Angela Merkel urging a thorough investigation of the crime. On Sunday, tens of thousands rallied in Moscow and across Russia in commemoration of the murdered politician.